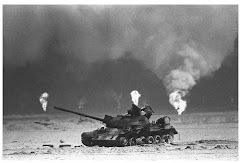 (91outcomes.blogspot.com - Kansas City, Mo., Thursday, September 3, 2009) -- The early results of a new study of pesticide exposures and anti-nerve agent pills in veterans of the 1991 Gulf War provides additional evidence that their multiple exposures contributed to their continued, chronic ill health. The study, funded by the Gulf War Illness Research Program (GWIRP) of the Congressionally Directed Medical Research Program (CDMRP), was presented this week at the 2009 Military Health Research Forum in Kansas City, Missouri. These early findings by Boston University epidemiologist Kimberly Sullivan, Ph.D. and her team of scientists are consistent with other similar studies of people chronically exposed to low doses of pesticides, which showed similar subtle effects on cognition and mood resulting from the exposures. The study's results are also consistent with major U.S. Government studies concluding that these types of pesticides could be among the contributing factors to some of the undiagnosed illnesses in veterans of the 1991 Gulf War. The pesticides are in the same class of chemicals -- acetylcholinesterase (AcHE) inhibitors -- as the pyridostimine bromide (PB) anti-nerve agent pills taken by about 250,000 (DOD estimate) troops during the 1991 Gulf War. In all, 696,842 U.S. troops served during the war, with the federal government now acknowledging that approximately 175,000 to 210,000 or more remain ill with a unique form of chronic multi-symptom illness commonly known as Gulf War Illness (GWI) or Gulf War Syndrome. Sullivan's research team interviewed 298 pest control military personnel who served in the 1991 Gulf War, including physicians, entomologists, environmental science officers, preventive medicine specialists, field sanitation team members, military police, and other pest controllers. In total, 159 inviduals were recruited from among the group for neuropsychological examination during a four-year time period. The study subjects were divided into four groups, depending upon which combination of exposures they had to low- and high-dose pesticides and PB pills. The group with both high pesticides and PB had significantly higher rates of reported health and mood symptoms, were significantly more likely to meet criteria for chronic multi-symptom illness (CMI), and performed significantly worse on psychomotor testing. Prior to Sullivan's study, it was unknown whether the cohort of Gulf War pesticide applicators had lasting neuropyschological or health problems, and if so, whether their health issues might correspond to their level of AcHE exposures. In November 2008, a definitive U.S. federal government report on Gulf War veterans' health released by the Congressionally-chartered Research Advisory Committee on Gulf War Veterans' Illnesses found that the combination of pesticides and PB used during the Gulf War were common factors in many Gulf War veterans and at least partially caused their resultant chronic multi-symptom illness. 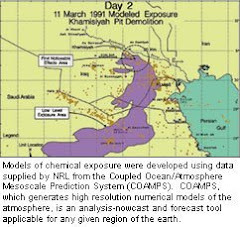 Several other toxic exposures, including sarin and cyclosarin nerve agent, microfine particulate matter from the hundreds of oil well fires lit by retreating Iraqi troops, and other Gulf War exposures could also not be ruled out as additional causes.